Remember starting up to a Happy Mac? Why would anyone buy a PC, when the Mac smiled back? Let’s kick of this week’s Think Retro with some blasphemy: today, there isn’t all that much difference between a Mac and a PC. Oh, yes, sure; for my money a Mac is still more powerful, more productive and just plain more lovely than a PC, even taken alone without the benefits of the broader Apple ecosystem. But setting aside the basic identicalness of the actual hardware powering the two platforms, most people could probably accomplish most tasks on either without too much wailing and gnashing of teeth. This is because, starting with Windows 95, Windows has made some astonishing leaps—if in a kind of agonizing slow motion—to bring it up to Mac-like levels of user-friendliness. But in days of yore—the mid 1980s—PCs were devilishly unfriendly things. I was called round to a relative’s house at one point to fix their computer because, like, you know, I had a computer, and I sat staring at the DOS command prompt in quiet bafflement, desperately trying to dredge up memories of the few occasions I’d ventured into CP/M on my Amstrad PcW10. From its very birth, though, when you switched a Macintosh on you were greeted not with a blinking insertion point which required special incantations even to get you to a more friendly graphical user interface once that became an option, but instead with a smile. It’s such a simple thing. Almost facile. But when you flicked the power switch on the back and were greeted with a smiling little representation of the very machine you just switched on, you instantly felt a kind of kinship with this strange and enigmatic hunk of technology. You could, I guess, say it was a cheap trick—you might not like having your emotions manipulated with quite such bare-faced chutzpah—but for me it was always one of those things that made the Mac truly special; that right from the start, you saw something friendly and cheerful and affirming. It made the ritual of booting your Mac that little bit more something to be looked forward to, that little bit more pleasing—and in the days when booting your Mac took several minutes, anything that made you dislike the process less was to be welcomed. The “Happy Mac” icon, which you see above, was of course designed by the wonderful Susan Kare, and it has now itself become truly iconic. The New York Times? Sure, I’m assuming this wasn’t front page news, but that such an august organ would run a story on an icon disappearing from a computer’s boot sequence is quite remarkable. “Beautifully rendered” is such a peculiar phrase, when the Apple logo was just a plain grey silhouette; I guess she meant something like “beautifully realized”, but “rendered” just makes me think of the process by which it is displayed on screen, and I get a bit giggly imagining a scenario in which the Apple logo is a bit squashed and badly upscaled and in really, really bad 3D, prompting Jobs to ask the designers to render it more beautifully. 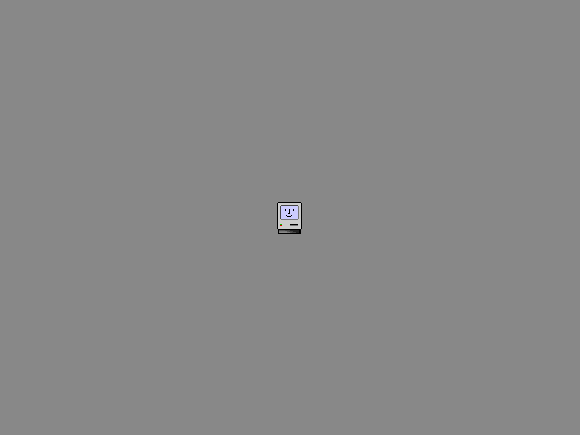 You could, though, replace the dull gray apple silhouette with any file of your choosing, and I remember delightedly swapping in a beautiful, lush, full-color Happy Mac from my carefully curated stock of third-party icons in Pixadex. The utility I used flashed up dire warnings about messing with your system, to the extent that I was really very nervous the first time I clicked the button to apply the change—I’m not one of life’s born tinkerers—but I loved it to bits once it was done. It really was an homage to my joy at seeing the Happy Mac smile back at me the very first time I switched on a Mac. Hey, little buddy! What are we going to do today?